Ten June: Light It Up! Wow! That looks Great Michelle! I can't believe how inexpensive you go it for too! Love the new shade!! It looks great in that room...really pops off the dark walks! Oh yeah! Looks so crisp and clean and I still love that wall color!!! definitely takes the room to a whole 'nother level!! love it. that is perfect!!! i found a fixture at lowes i want to get that has a big drum shade and is perfect for our table... you've inspired me. i need to get on the ball! Wow! That is SUCH an improvement. You are one lucky duck for finding that pendant at such a low price! Loving the sunburst mirror so much right now too! Wow--that makes such a huge difference! I looks awesome! Looks perfect! Can't beat the price either. I'm SO late to this party, but I'm so glad to finally arrive! Loving your blog and catching up on what I've been missing! 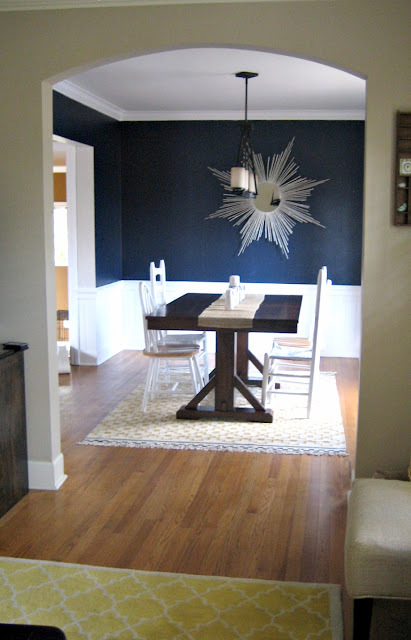 The navy looks great, love the new pendant and your basement carpet is great!! Who all gets excited over carpeting say "hey"? HEY!!! Excellent redo---dramatic difference - you could submit this to a magazine - the upside to everything! I like it so much better! Very crisp against the dark wall. Love the bargain price too! When it's time to design/decorate my new home will you come do it please? I love the way the dining room looks! Great switcheroo. I have a similar light fixture, as your new one, in my dining room too. It works so well with so many decors. A nice classic. LOVE the change. Wow! What a difference that makes! Love it! and what a steal!! Love seeing progress and transformations in your home! ummmmm, LOVE! it fits the room PERFECTLY! SO much better, I love it! HUGE difference. The white really marries the chairs as well. Love it, girl. It looks so nice now. You could totally think that was a picture taken for a home decor catalog! It looks really great! I like it a lot...and you can't beat the price!!! And, I'm really considering the same rug for our dining room. Do you like it? Great improvement! What a steal on the price! Doesn't it make you so happy when you find the perfect solution to a problem spot. It's perfect in the dr. Perfect! I didn't mind the other light fixture, but the new one just takes it to a different level! So pretty! Enjoy it! LOVE IT!!! the new fixture is so pretty and goes with the room perfectly! Love it! What a difference! The new CB2 light looks *awesome* in your dining room! And I'm amazed that you scored it at such a great price. I just stumbled upon your blog and love your style! I'm just wondering where you got your rugs for you dining and living room?? I agree with everyone; this pendant makes that room even better than it already was. And you got a great deal; very nice, Michelle! 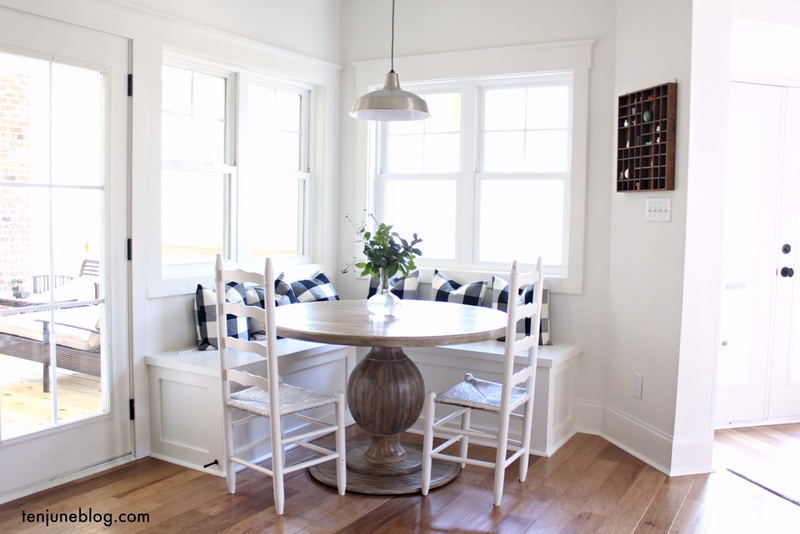 I love the look of your diningroom! I'm in the middle of renovating mine and have been undecided on colour, that rich tone has me excited! I'm always looking for cool decorating blogs that are "reality" based and I love yours.